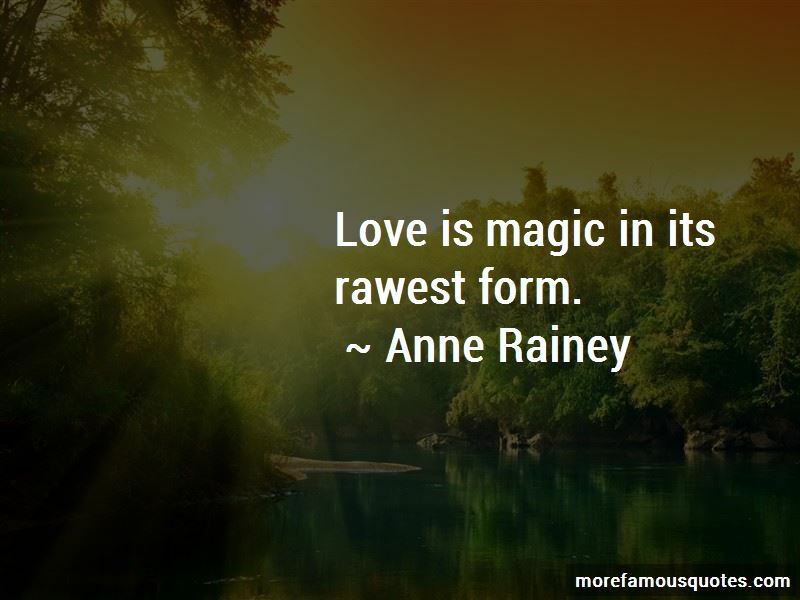 Enjoy the top 7 famous quotes, sayings and quotations by Anne Rainey. “Actually, yeah, I did buy a few new things," she confirmed, then she teased a little more by adding, "I think Pete is going to really enjoy my outfit tomorrow night." "Pete seems to like you no matter what youre wearing," Luke grumbled. "So, what did you buy for good ol Pete?" Darn, if he didnt sound jealous! Could it be possible? Itd mean she meant something to him. Something more than Dr. Doolittle anyway. "I bought a mini skirt." She wouldnt tell him about the hair and the shoes. Or what she bought to wear under the skirt. She heard him cough. Hard. As if having a spasm. "Luke? Are you okay?" A couple more very tense seconds of coughs, and then, "Did you say a skirt?" “Careful old-timer, your age is showing." "Hey, I'm only thirty-two. I'm in my prime, woman!" She harrumphed. "Well, I'm a mere twenty-five and you're way too old for me." “If you'd rather skip lunch, that's fine with me. I've got some things to take care of anyway before I can leave the store to Robin for the weekend." "I don't want to skip lunch," he bit out. "I'm starving." Her temper got the better of her. "Fine, but if you plan on snapping at me the whole time then I'd just as soon you eat alone." His gaze darkened. "I'm not snapping." She poked him in the chest. "Yes, you are." Leo started to speak, then paused and let out a huge breath. "Sorry. Damn, I'm just having one of those days." “Heather leaned toward me and placed a soothing hand on my knee. "It'll be fine, sweetie. You'll see." "I've never done anything like this. What if I can't go through with it? I'll feel like such a dolt." “She reached for the milk and honey soap, then poured it into the puff, but when she started washing him with it, he chuckled. "Hmm?" Candice mumbled as she stared at some interesting spot on his arm. "Real men don't use puffs," he said, amused and turned on by having Candice's undivided attention. She finally managed to drag her gaze away from his forearm and stared at him as if he'd lost his mind. "You can't be serious?" When he only shrugged, she rolled her eyes. "What does it matter what I use, so long as you're clean?" "It matters, believe me." Blade knew he sounded absurd but he couldn't help it. It was bad enough he'd let her put bandages on a few measly cuts; if word got out he'd let her use a peach-colored puff and milk-and-honey bath soap he'd never hear the end of it. "Pete seems to like you no matter what you're wearing," Luke grumbled. "So, what did you buy for good ol' Pete?" Darn, if he didn't sound jealous! Could it be possible? It'd mean she meant something to him. Something more than Dr. Doolittle anyway. "I bought a mini skirt." She wouldn't tell him about the hair and the shoes. Or what she bought to wear under the skirt. Want to see more pictures of Anne Rainey quotes? Click on image of Anne Rainey quotes to view full size.